We all like some greenery in our neighbourhoods. But as I noted in this rant blog post, one bane of pedestrians is bushes and trees overhanging footpaths. They’re not really obvious unless you’re walking, but bushes and trees like this are everywhere. I’m sick of having to duck out of their way. This is especially difficult when it’s dark. You can easily not spot the hazard as you approach. 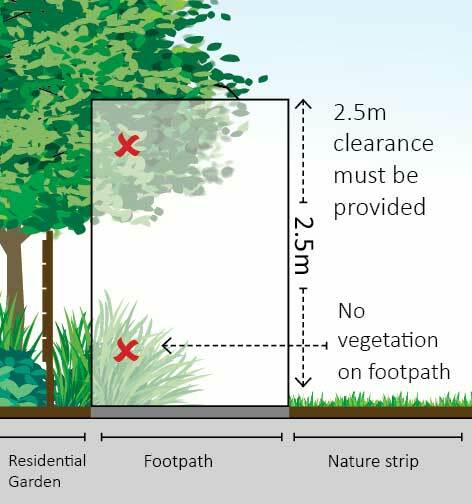 Trees must be trimmed to a height of three metres above the ground and, at least, vertically in line with the property boundary. 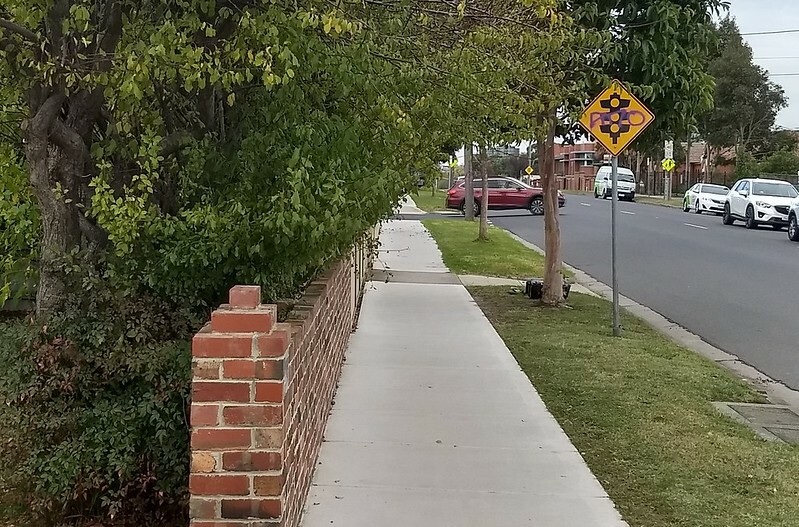 Shrubs must not protrude beyond the fence line or encroach onto the footpath. If a Council notice is sent requesting that trees or shrubs be trimmed, the work must be completed within 14 days. Property owners who do not comply with a notice within 14 days will be issued with an official warning notice. This provides a further 10 days to complete the work. If action is still not taken within the required timeframe, a penalty notice of $200 may be issued and a contractor will be engaged by us to undertake the necessary work. The property owner is responsible for the contractor’s fees. When I checked with the council, they said they don’t do proactive inspections. It’s up to people to report problems. But how many people know what the rules are, and that you can report them? No wonder it’s such a widespread problem. What the council does do is when looking at a reported site, they will look at the immediate surrounding area. They also said that for overhanging branches from trees on the nature strip, the council is ultimately responsible — though it sounds like they’d prefer if property owners kept them under control. One weekend I went for a walk along some main roads near home, and noted down some particularly problematic locations to report. I used a stricter criteria than the council. The council standard is 3 metres of clearance. I decided I’d only report it where I had to duck to walk under it (I’m about 1.8 metres tall), or if it was blocking enough of the footpath that a parent with a large pram, or someone with a mobility aid/wheelchair would have to detour onto the grass to avoid it. On a 6km walk, I found about two dozen problematic locations. About 90% of them were bushes and trees growing from private property. A small number were on the nature strip. And I reported a bunch of them. With most trees and bushes that overhang the footpath, you can brush past. Not this one. 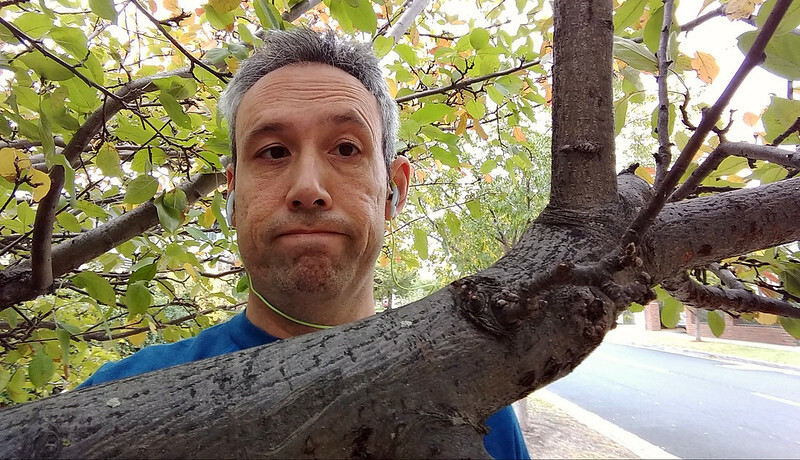 The main branches are so thick that you’d do yourself an injury if you collided with it. It’s right at head height. Someone had put a bit of hazard tape on it, but one wonders how it was ever allowed it to block the footpath like this. Update 15/5/2018: Sometime in the last 72 hours, the tree in question has been pruned back markedly, such that it is now clear of the footpath. I described this on Twitter the other day, but I’ll expand on it here. I was heading out in the car on Saturday afternoon. Got in, beeped, looked behind me, slowly backed-out of my driveway. BANG! A cyclist riding along the footpath with his dog (roughly at running pace) collided with my car. I stopped, moved my car back into the driveway, and asked if he was okay. Thankfully he was. And his dog. They carried on down the street, at the same speed. 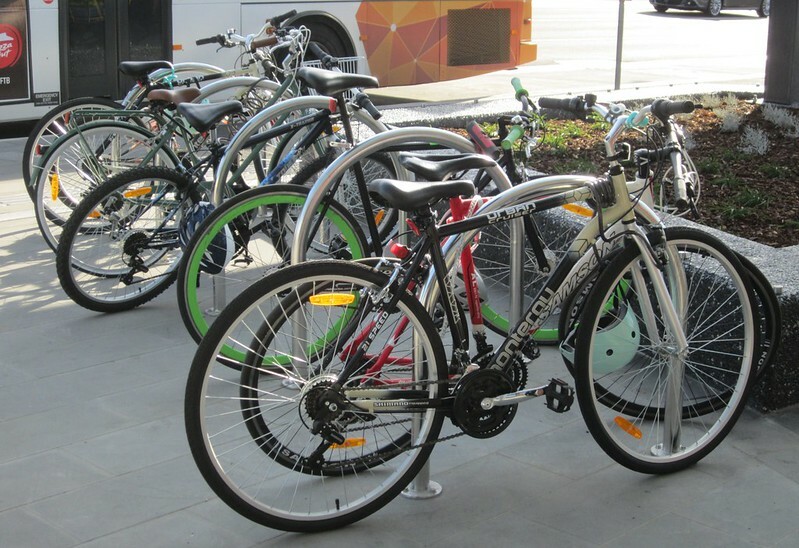 Cycling forms a vital part of the transport network, helping people travel longer distances than might be practical by walking, but without having to drive a vehicle. Sometimes there are good reasons for cyclists to avoid riding on the road. Riding on some roads can be perilous due to driver behaviour. Probably not my on street though. It’s fairly quiet. But what would you do if taking the dog out for a run? The problem isn’t so much the bicycle itself, as the speed compared to other footpath users. Just as cyclists come of worse in on-road collisions with motor vehicles, pedestrians come of worse in footpath collisions with cyclists. For a bike going at anything much above walking speed, there’s a real danger of a collision with a vehicle or a person, especially given limited visibility to/from driveways and garden paths — in fact years ago one of my sons was hit by a cyclist while coming out of a front garden gate. And yet some cyclists will persist in riding at speed along footpaths. Really not a good idea. My fence isn’t high, but the speed he was going, I’d have little chance of spotting him even if driving out forwards. And he obviously didn’t spot me, and either didn’t hear the beep, or didn’t realise where it came from, or couldn’t stop in time. There is one thing I could do: my driveway is short enough that I could have a quick look up and down the footpath before I get in the car. It might help. It wasn’t planned this way, but this week’s posts seem to have been all about pedestrians/walking. Along with rules about not parking over footpaths (and vehicles needing to give way to pedestrians when crossing footpaths), some people seem to be unaware that there are rules about keeping vegetation clear of footpaths. Able-bodied people can duck or brush past overhanging trees, or detour onto a nature strip, but someone pushing a mobility aid or a pram may not be able to do that. Property owners are responsible for keeping trees and shrubs under control and trimmed back to ensure pedestrian safety and clear sightlines for drivers. Why 2.5 to 3 metres? I suppose it allows for cases where rain weighs down tree branches, bringing them lower. You also need to account for an adult riding a bike (accompanying children doing the same, which is perfectly legal) — their height is likely to be higher than 2 metres. What’s not clear to me is whether property owners or the councils have responsibility for trees on the nature strip. 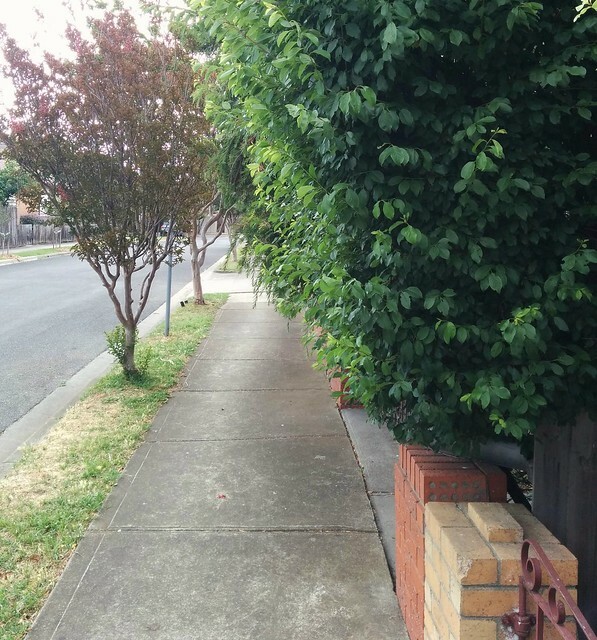 City of Monash says: Council acknowledges its duty to ensure street trees and other public vegetation does not encroach onto footpaths. …but other rules imply that property owners are meant to keep nature strips under control. Personally, I’m happy to take this responsibility. It’s worth checking the precise rules in your area. Do your bit to help walkability: for the sake of pedestrians in your street, keep overhanging trees and other vegetation off the footpath. 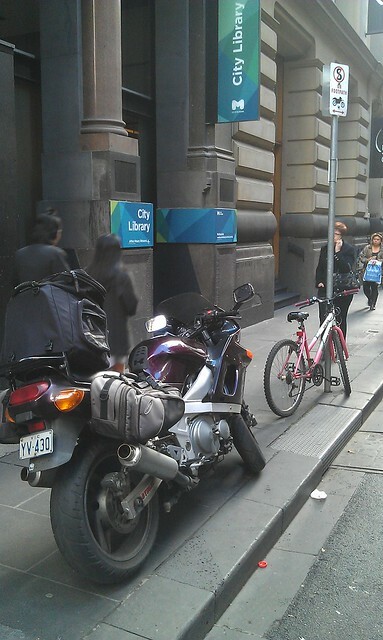 Motorcycle/scooter parking on footpaths – In a crowded city centre, this doesn’t make sense. 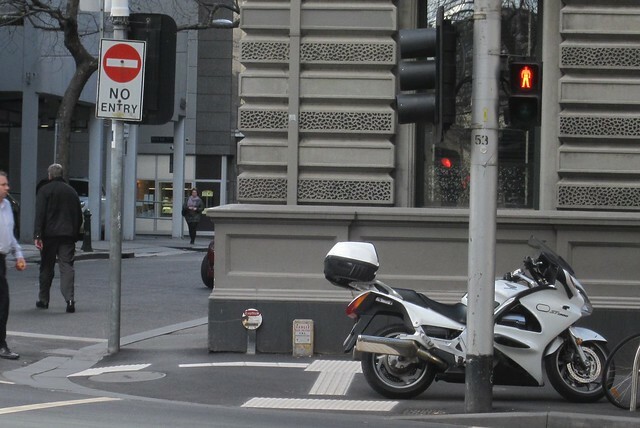 Some years ago I wrote about issues with the City of Melbourne policy of allowing motorbikes and scooters to park on footpaths, except in a few locations where it’s specifically banned. The problem is, most of the guidelines seem to be ignored. 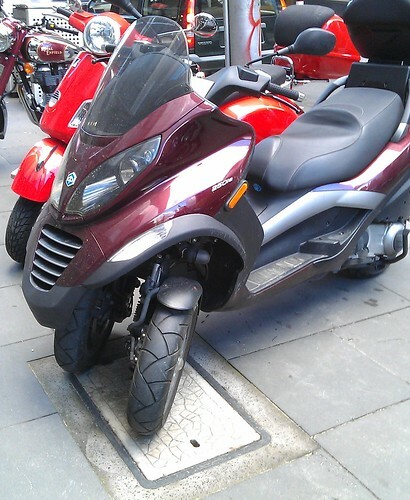 DO park at least one motorcycle wheel diameter back from the road kerb, to allow pedestrians free access to and from the road and to parked vehicles (You can leave less space between your motorcycle and the kerb if you park next to a “no stopping” zone). — it’s a bit hard to tell, as most such areas seem not to be well-defined. — this is far too vague, but based on the second and third points, one could conclude that it means don’t park on footpaths so narrow you can’t leave a motorcycle wheel diameter from the kerb, and a motorcycle length from the building line. This should automatically make any footpath narrower than a motorcycle length (plus a wheel length) out of bounds. — some areas can be identified as private property, but it’s not possible to tell if permission has been given. — I didn’t find any evidence of this. Exhibition Street, west side footpath, adjacent to Her Majesty’s Theatre. 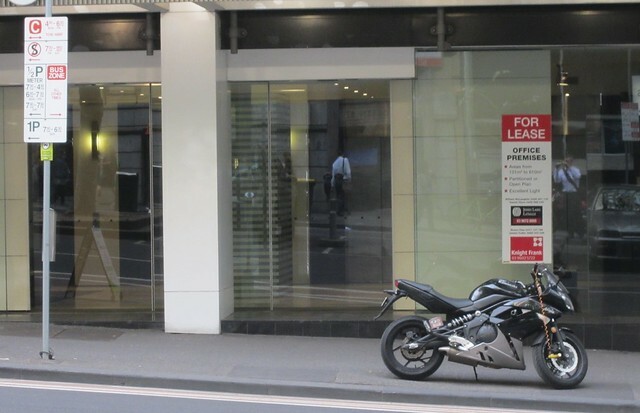 In Victoria you can legally park your motorcycle/scooter on the footpath (unless otherwise signed), as long as you do not obstruct pedestrians, doorways, delivery vehicles, public transport users or access to parked cars. 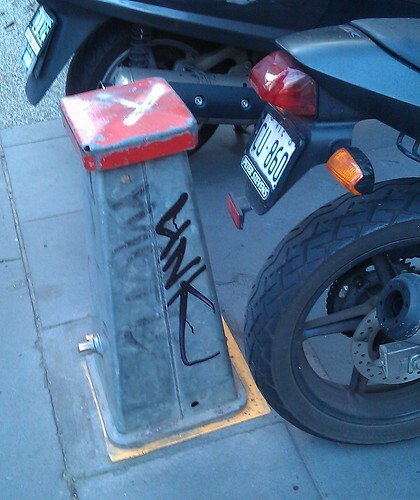 Firstly, I have a philosophical disagreement with the idea of motor vehicles being parked (and driven) on footpaths. Many CBD footpaths are already congested. As the CBD continues to get busier, it’s going to get worse. In the past ten years, total daily city numbers have grown from 679,000 to about 830,000 — about 22%. 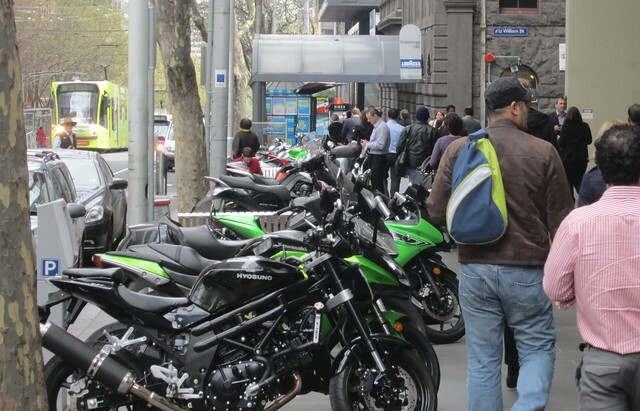 While the number of CBD visitors using motorbikes remains proportionately low (less than 1% — a comment on the previous post said about 1200 per day), obviously as the CBD gets busier, the numbers are likely to increase. Efficient movement of people around the city means encouraging the most efficient mode: that means pedestrians. But their space is being encroached upon by a relatively small number of other users. Note that cyclists in general don’t cause these problems because they need to be left chained to something, such as a pole, restricting where they end up parked. Pushbikes are also physically smaller. Firstly, the rules as they stand don’t seem to be enforced, and are widely ignored, or perhaps not even common knowledge among motorbike and scooter riders. Are they even enforceable rules? Or are they just guidelines? I’m guessing the latter. Either way, whatever the rules are, riders need to be made aware of them, educated, and then the rules enforced — even if it’s just issuing notices advising of what not to do. Secondly, the free-for-all just doesn’t make sense in a busy city centre. 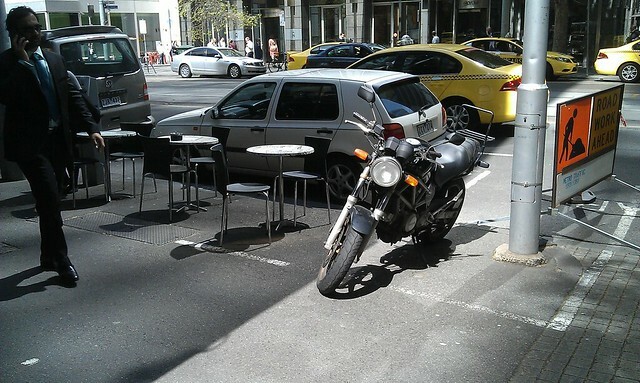 With pedestrian numbers continuing to increase, and motorbike riders accounting for less than 1% of the total daily CBD population, this is simply not efficient use of footpath space to have them sitting there all day. It probably explains why other capital city CBDs don’t allow it. 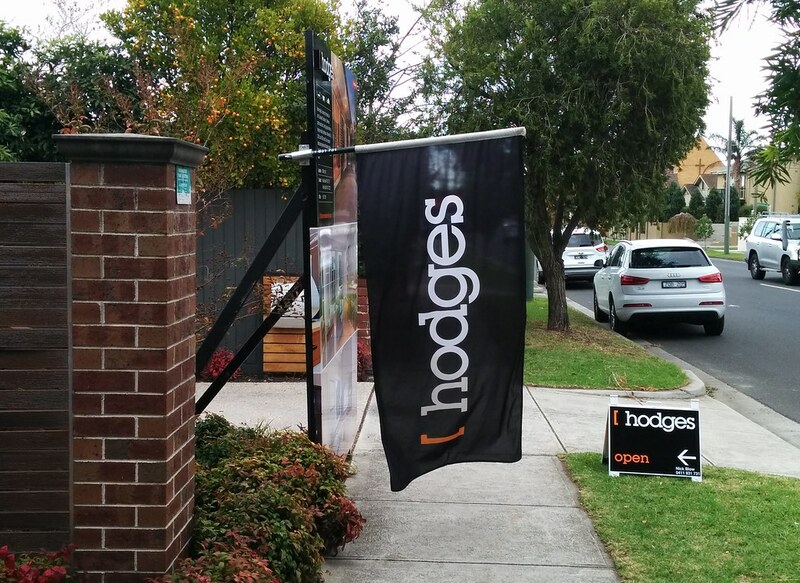 In comparison, many local councils have cracked down on footpath trading in recent years because of concerns about pedestrian flows and the vision impaired, and have provided clear rules about where traders can place displays, signs, tables, and so on. There doesn’t seem to have been any such clarity around motorbikes, and formalising the current guidelines and enforcing them would help a lot. I’d much prefer the policy was changed to allow motorbikes on the footpaths only in defined areas — opt-in rather than opt-out. 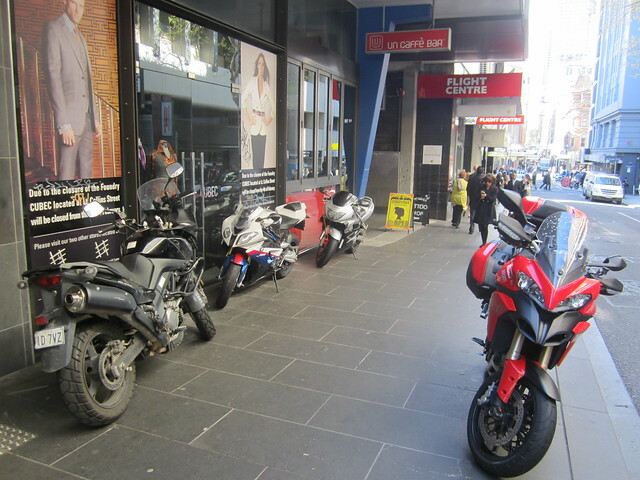 There are “motorcycle precincts” such as parts of Elizabeth Street where their presence is to be expected, and there are spots where it works fine, for instance opposite some tram superstops where there are wide footpaths with plenty of spare capacity, and barriers mean nobody needs to park cars or cross the road at that point. 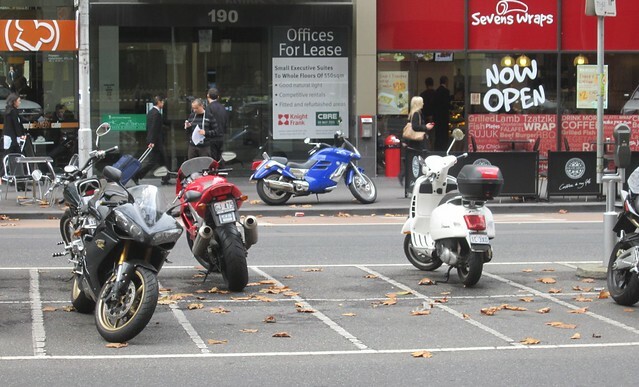 The other thing that should happen is the replacement of more on-street car parking with motorbike parking. 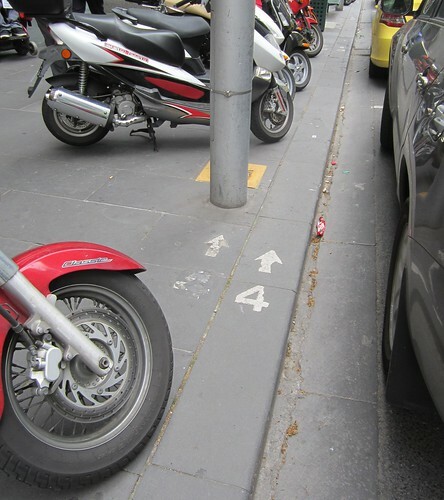 It makes sense because motorbike/scooter parking on the street is more efficient use of space than car parking. Plus there’s lots of off-street car-parking, and in any case car traffic needs to be discouraged. 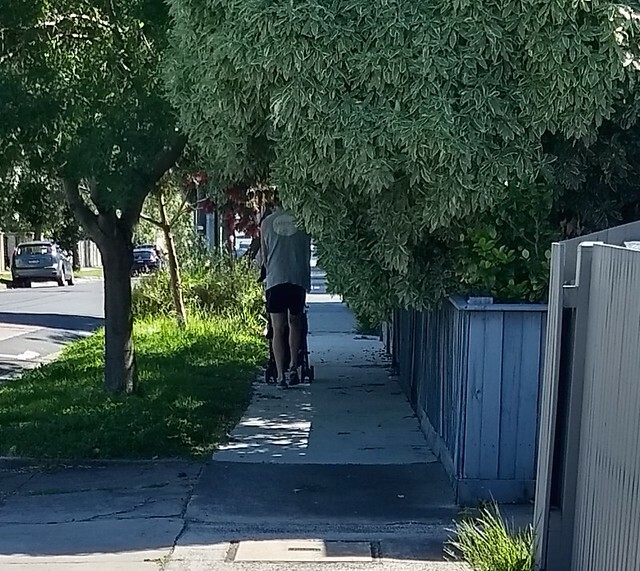 If there isn’t a switch to opt-in footpath parking rules, then there should at least be a blanket ban on parking on narrow footpaths (going by the points in the existing guidelines) and bans placed on areas of high pedestrian traffic, such as around the railway stations. 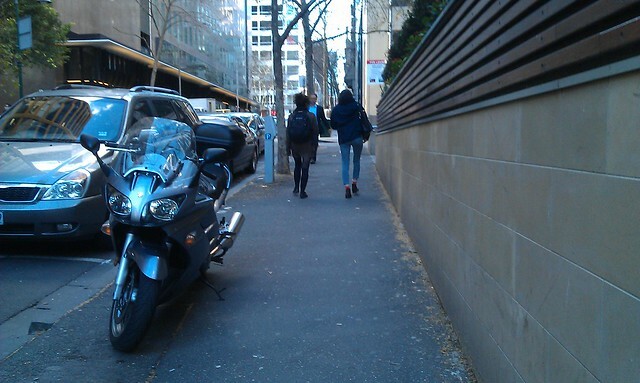 Ultimately though, the City of Melbourne should be prioritising pedestrians on footpaths. They account for the majority of footpath users, with numbers increasing every year, and are the most efficient use of the available space. When I’ve raised the prospect of a change on Twitter, people cite a motorbike protest some years ago which was probably how the current policy came about. 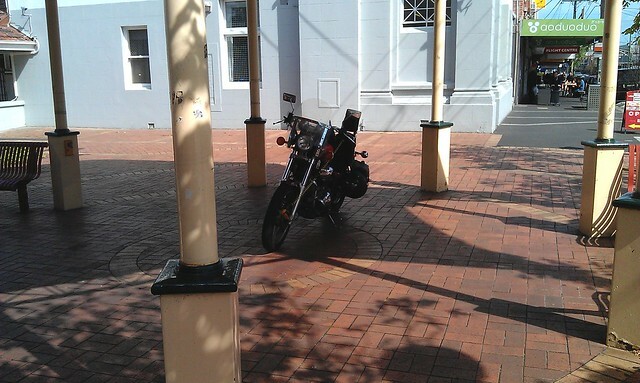 Motorcyclists parked (quite legally) one motorbike per car spot in protest, and the council surrendered. They imply this could happen again. You know what? The threat of protest doesn’t make it a good policy. And I think you could predict my attitude to this specific protest — a protest inconveniencing CBD motorists (another minority mode)? Let them. I don’t care one bit. It’s very much in the eye of the beholder, but what about the heritage and character of our streets? 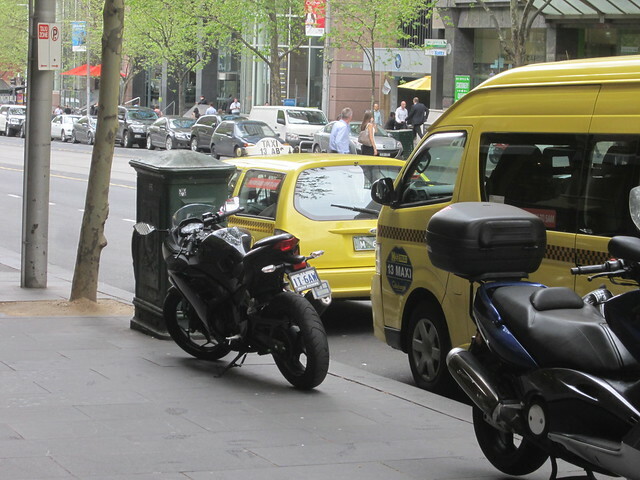 Beyond problems of efficiency, of footpath capacity… do we actually want every street in Melbourne to be overrun with parked motorcycles and scooters? Last night I spotted a violation of parking where specifically signed that you shouldn’t. Picture inserted above. And City of Melbourne Lord Mayor Robert Doyle has advised me that, as I suspected, they are unenforceable guidelines, not rules. @danielbowen: Guidelines not really enforceable and not CoM's. Our Parking Officers do issue fines for obstruction. 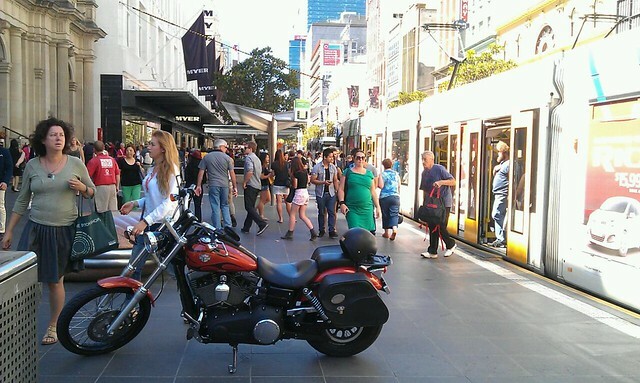 This remains a problem, and in some spots it appears to be getting worse — recently, at two motorcycle riders have started parking on William Street near Flagstaff Station, where pedestrian crowding is so bad (up to 3600 people per hour) the City Of Melbourne has installed automatic pedestrian counters. 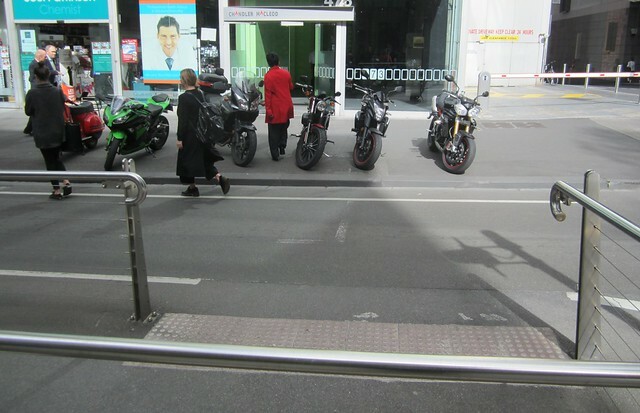 What they haven’t thought to do is ban motorcycle parking there — or indeed remove a few car spaces and widen the footpath. 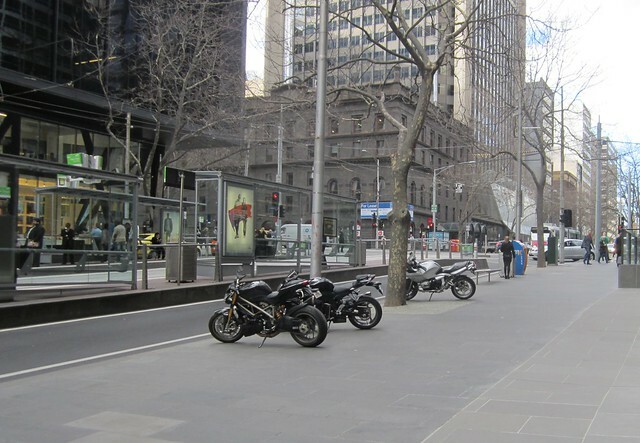 submissions to the City of Melbourne’s draft Walking Plan in August/September 2014 noted that motorcycles are frequently parked in ways that do not meet VicRoads motorcycle parking guidelines and cause pedestrian congestion and obstruction. Pedestrian numbers in the city are increasing. 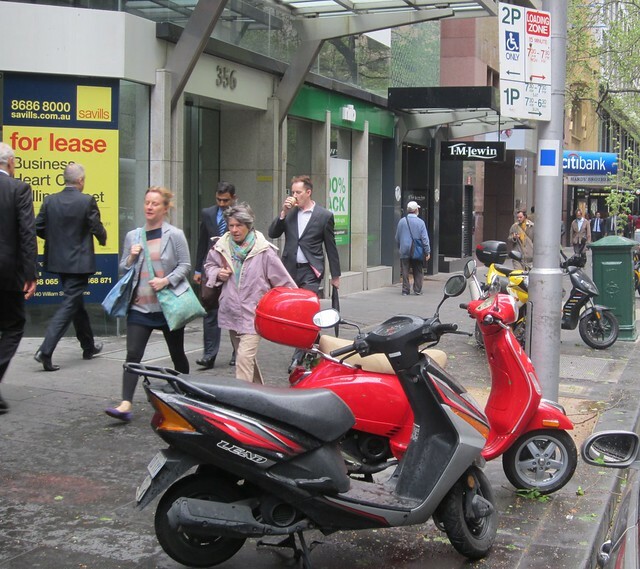 The draft Walking Plan proposes minimum crowding levels for pedestrians, and includes an action to assess footpaths where pedestrians are overcrowded and take action to reduce crowding. … but ultimately, makes no recommendations around changing the rules, or even educating or enforcing the guidelines.